It's December, holiday season, and it's time to send your best High Speed Train. The nomination period ends December 18th. Is there a minimal speed limit for high-speed trains? (Yes, I realize this could turn into a long discussion). No. You just need to convince the voters it's a high-speed train. Well the noob ist to be the first one. "High Speed Train"? - that's great! I don't need any license, could you add a "do with it what you want" license? Very nice submissions! pak192.comic is really maturing nicely. Here I leave my contribution to this month contest. This is pak128.Japan, in a game that was made just to take this picture. I give permission to everyone to use it as they want, free from anything. This is an high speed line connecting Osaka to Tokyo. Difficult terrain, requiring robust constructions so that this line maintains a high average speed. The sites are beautiful, but are only seen when outside the many tunnels. This is my dear Shinkansen. this sight looks one about 6 years ago. I have ever taken this train ,and it was my delightful memory of vehicles Next to Pokemon jet '98. The train ,however unfortunately, retired from Tokyo to Osaka line in 2010 ,and replaced by N700 series. The fastest steam engine LNER Class A4 with MK.1 carriages and the fastest diesel engine BR Class 43 aka Intercity 125, meet each other on hundred years old brick viaduct. And Royal Mail Class 325 EMU is passing under the bridge. Real game, played on demo map of pak128.Britain, current game year 2013. These trains were retired years ago and replaced by BR Class 180, but I bought them again and sent them for a nostalgic ride. This is an impression from my 450 sim years old 19th Century Pak64 AddOn test simulation started in 2007. A real game, in deed. It is a very challenging game due to its age. Lots of bottlenecks everywhere. The last 2 years I managed to reduce the amount of waiting passengers and goods to less than 1,000,000 at all stations again. You can't avoid a license, since you are from germany. The german "Urheberrecht" reserves you the right as creator (Urheber) always. Else you could put it under a CC0 license, wich is similar to puting it under public domain. Just consider the 'license' as a tag to let people know they can use it without asking you for your consent. You can avoid a licence, since this server is on the US and you are publishing here and not in germany. But lets discuss licences elsewhere. License CC-BY-SA 3.0 - pak128.japan+addons - not a real game. Decades ago, you were lucky if you can get a shinkansen ticket, specialy in the countryside cities. Taking the title literally, my entry features two High Speed Trains passing at Taunton in Somerset. The train on the left is heading to Penzance from London Paddington. The HST in the platform is waiting to form a semi-fast service to Paddington. The CrossCountry Voyager in the platform is pausing on its route from Plymouth to Edinburgh. There are some crazily good screenshots out there! Title: All aboard, departing in 5 minutes! 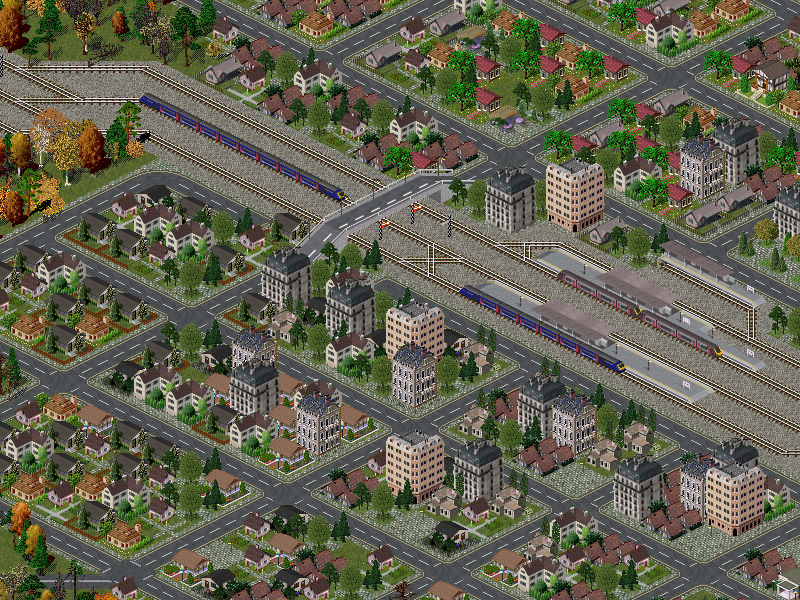 Description: A small town where are crossing three ČD 680 Pendolino. It is most frequented crossing on whole track. A lot of passengers are here waiting daily for these trains to go to work or school. "These trains are the best of czech railways" says one of passengers. Talgo (Light Articulated Train - Goicoechea Oriol) trains were a completely innovative train concept designed first in the 1950 decade. Their wagons were lower and shorter, and they had no boogies being the wheels between the wagons. Because of that, Talgo trains could go faster in curves safely. They had been the best high speed railway service in Spain during decades, until the development of modern electric high speed trains. 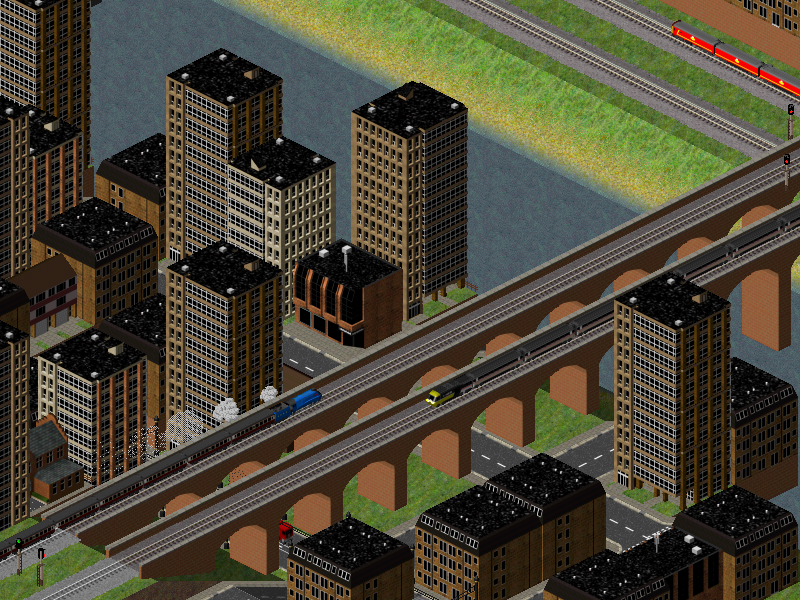 In the screenshot we can see a Talgo II train, crossing a dam near a hydrolectric power plant. Also there are a milk truck and a little bus going along the northern road. - Hispano Suiza 66 G (milk truck). - Dodge Brothers Majoral (green bus). Also, another addon is included: electric dam. 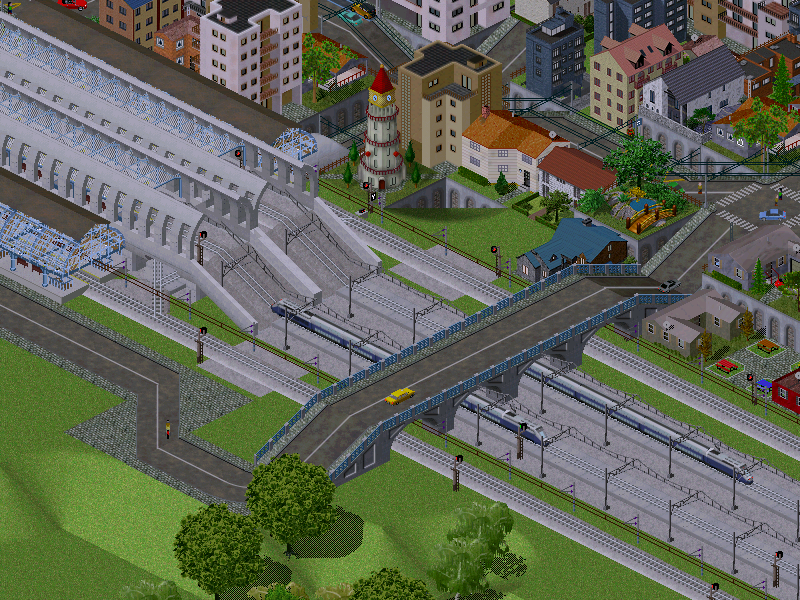 This state-of-the art station was built on the first Highspeed railtracks between 2 big cities of my map (Lyon: 300.000 inhabitants and Montpellier: 250.000 inhabitants). The station belong to the city of Valence (50.000 citizens), not visible on this screen, located near to the railtracks between Lyon and Montpellier. The station looks like it is lost in the middle of the landfields but it has a strategic position. Indeed, a lot of highspeed trains through daily the station, participating in the economic development of the region of Valence. A little CBD is under construction in front of the station and a regular bus line link the station to the downtown of Valence. To regulate the important flow of trains on this line, two additional railtracks were built between the two platforms to allow special trains with no stop to cross the station at full speed, without any risk for the passengers. More, two footbridges allow the passenger the link the two platforms...... OOOH, you can cross railtracks yourself by foot but you may be suddenly ram by one or 2 highspeed trains at the same time!!! Well... If you want to watch some High Speed Trains, why don't you go to the place where they get parked? the High Speed Train Parking Yard! This is a scene just made for this picture, not a real game. 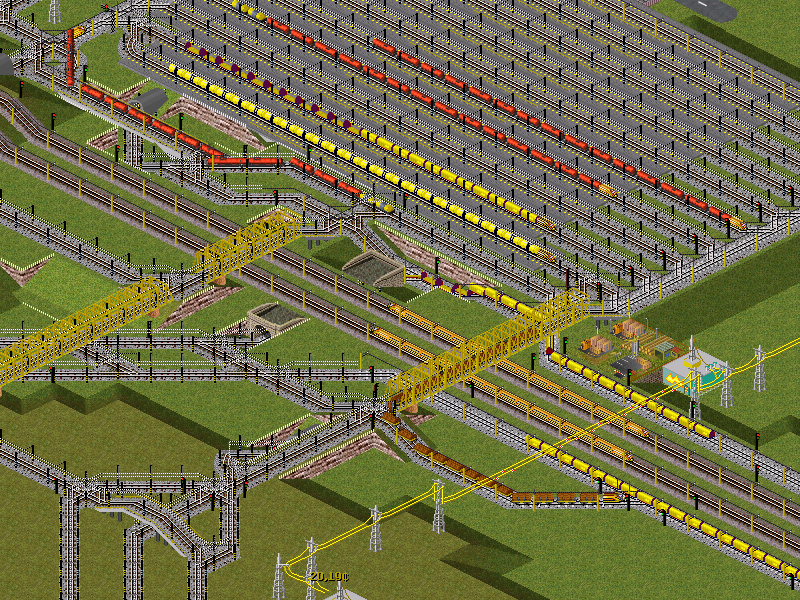 It shows us a little view of the yard where the highspeedtrains are parked. The trains we see are the Swedish X2000 in the old blue-grey colorsheme and the same train after its being repainted to its new grey colorsheme in the lower end. The X2000 where build in the 90'ties and with its new feature, tilting in curves, it could travel on the old and curvy tracks of sweden with a topspeed mostly at 200km/h! Also, there have been sneaking some RC-locos which uses the limitted parkingspace in the yard. Two high speed trains meet in the high speed corridor outside Abbeville. This is the border of the Agen-Angers metropolitan area. On one side you have vast fields which allow the quad track setup (centre for high-speed trains, sides for freight/local trains). Once you pass Abbeville the high-speed track become elevated due to the narrow rail corridor.